BRADLEY WIGGINS HAS spoken out against calls for TUEs — or Therapeutic Use Exemptions — to be made public, branding the idea “ludicrous”. Wiggins, a five-time Olympic gold medallist and the 2012 Tour de France winner, is one of several athletes to have had private medical data released as part of the Russian cyber-hack on the World Anti-Doping Agency (WADA). The ‘Fancy Bears’ leaks revealed the Briton was granted permission to use asthma medication salbutamol from 2008, while triamcinolone acetonide was approved in 2011, 2012 and 2013. TUEs allow athletes to use banned substances if they have a genuine medical need and there is no suggestion that Wiggins, Team Sky [who he rode for at the time] or any other athlete named in the leaks has broken any rules. Team Sky boss Dave Brailsford, who has come out strongly in defence of Wiggins, is among those to have proposed making TUEs public in future in a bid to increase transparency. However, Wiggins has taken a different stance. When asked by the Guardian whether he thought the exemptions should become public knowledge, the 36-year-old said: “No I don’t, no. “How many people are on TUEs for a start would add context to what’s going on in the peloton at the moment, but I think just throwing them out there, ‘this is what he’s on, this is what he’s on’, that’s ludicrous. “I mean there’s all sorts, people might have sexually transmitted diseases that they are on TUEs for, that’s too sensitive for some people. Wiggins was speaking to William Fotheringam, who ghost wrote the rider’s book ‘My Time’, which contained no mention of his hayfever-like allergies. Questioned about the omission, Wiggins commented: “To be honest, this was something I’d lived with since I was 15 years of age. I’d had attacks when I was 15 at juvenile races in Norwich and stuff in the summer. “My mother suffers from it terribly. It’s a genetic thing. It’s something I’d got used to. “I was paranoid about making excuses: ‘Ah, my allergies have kicked in’. I’d learned to live with this thing. It wasn’t something I was going to shout from the rooftops and use as an excuse and say, ‘my allergies have started off again’. “That’s convenient isn’t it Brad?, your allergies started when you got dropped. “I didn’t mention it in the book. I’d come off a season of… I’d won everything that year. When I was writing the book I wasn’t sat there thinking, ‘I’d better bring my allergies up’. 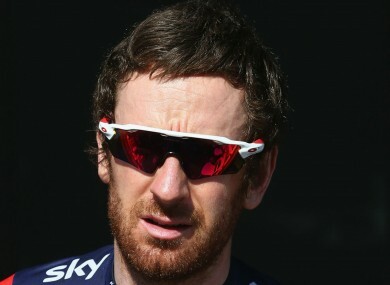 Email “Wiggins lashes out against 'ludicrous' calls to make TUEs public”. Feedback on “Wiggins lashes out against 'ludicrous' calls to make TUEs public”.